Enjoy the best Manuel Antonio Surfing Lessons provided by Local & Expert Surfers of Manuel Antonio, Costa Rica. Manuel Antonio Surfing Lessons with The Best Local Surfers of Manuel Antonio, Costa Rica will provide an amazing learning opportunity for beginners to ride their first wave. It is also a great opportunity for those who have experienced surfing before to learn very helpful tips from Local Surfers who have many years of surfing and constantly looking for ways to improve their skill. The surfing lessons in Manuel Antonio are one of the top beach activities. The instructors are professional and local surfers with years of experience and will help you to ride your first wave. The waves in the Manuel Antonio Beach are perfect for first time surfers. Manuel Antonio Surfing Instructors will get you riding your first wave in no time. If this is the first time you attempt to get on a surf board and try to ride a wave, do not worry, the instructors are there to teach you step by step until you finally achieve your goal or surfing that very first wave. Kids seem to be very interested in learning how to surf, so the surfing instructors have a lot of experience teaching young kids how to successfully ride a wave. The Beaches of Manuel Antonio Are Perfect For Surfing. When it comes to surfing, you have probably heard of very famous places like California or even Hawaii. Yes, these places offer some of the best surfing in the World, but through the years, Costa Rica has risen to be one of the Top Places for Professional Surfers as well as first time surfers. 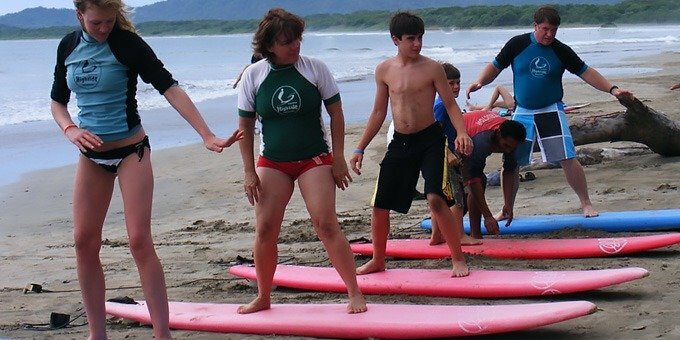 The surfing lessons take place in the beaches of Manuel Antonio, Costa Rica. The beaches of Manuel Antonio are extremely special because they offer small waves for beginners. These small waves are ideal for those who have no experience surfing before because they are much easier to ride than a bigger wave. Below are the prices and starting time for the surfing lessons. Total surf lesson time is 3 hours. Includes: All equipment (surf boards, rash guards, leashes), water and snack. Transportation to and from the lesson included. Location: Manuel Antonio or Quepos. The surfing instructors speak very fluent English and of course Spanish. A vast majority of the people interested in learning how to surf will either speak English or Spanish and this will allow you to have a great communication with your instructor. We think this is very important in having a great surfing lesson. If you understand very well what is being taught, you will have a high chance of riding your first wave. The beaches of Manuel Antonio, Costa Rica are very calm and if you are learning how to surf, you will be spending most of the lesson near where there is less water and your instructor will be with you during the entire lesson. All of the have gone through a very extensive training course in order to become actual surfing instructors so you can be sure you are with the Pros. Surfing Lessons in Manuel Antonio for Beginners. You will be learning and receiving special tips and secrets from actual surfers who dedicate their life to the sport of surfing and can provide you with the best advice on how to ride your first wave. You will find it easy to learn how to ride your first wave, especially when you have the help from Local Surfing Experts. The Surf School has a very large selection of the best surf boards for you too choose from. There are special long boards that are ideal for first timers as well as surf boards for those who have experience with surfing before. When you arrive at the Surf School located in the main beach of Manuel Antonio, your instructor will ask you several questions to determine your skill level and from there you will handed a Surf Board picked specifically for you. You have a total of 3 different surfing lessons to choose from and you are probably wondering which lesson is best for you? Well, it is important to know that in each of the different surfing lessons you will receive help and instructions from your surfing guide on how to properly ride a wave. However, the different between the 3 surfing lessons are that for example, the regular season is where you take the surfing class with other guests. While in the private lesson you get a one on one coaching with the surfing instructor.